I feel like it's been an unusually long time since the last Games full length, though that just may be time slipping by faster as I get older. 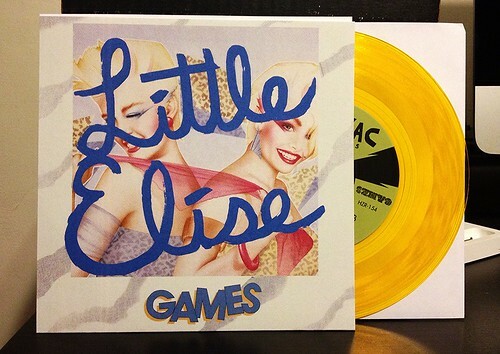 That being said, I've been eagerly waiting the band's follow up and it finally arrived as the Little Elise 7" limited to 150 gold vinyl version on Hozac. Hozac puts out a lot of records. Some I love, some being a bit too scuzzy for my personal taste, but I always enjoy getting the gold vinyl version in the mail when I do order. The Games 7" picks up where their full length left off, though I will say the guitars sound a bit fuller and more pronounced than last time. To the band's benefit. A-side "Little Elise" has a vocal melody in the verse that's eerily similar to "California Girls," but it's not a carbon copy all the way through with its call and response bridge that builds into a chorus complete with all of the "aahhhs" and "ooohs" that I'm looking for in great pop music. B-Side "About Me"is another bouncy pop song to add to Games' catalog of hits. The jangle on the guitar is turned way up along with some fun lead guitar noodling going on through the chorus. Both songs are excellent and I can only hope it's not as long of a wait to hear what Games comes out with next. Hopefully it's a new full length.